When something isn't working out, you need to change your approach. Doing the same thing over and over again will just make you frustrated and will not help solve your problem. Stop and think about problems other than your own. In the end, Floyd did get his kite back, but he didn't fix the problem he created. How will his parents feel about that? How will everyone stuck in the tree be feeling? Ask for help when (before!) things get out of hand! And lots of traditional language goals can be targeted as well! I read this book with two kids who were working on different goals: Answering wh-questions and describing object functions. Both had pragmatic issues as well. It is also a great one for teaching prediction and inferencing. See below for specific ideas. Cover: Who is this story going to be about? What do you think will happen? Page 1: Where did his kite get stuck? Who did the kite belong to? 2/3: Why did he throw his shoe? What do you think he will do next? 4/5: Who is Mitch? what will happen next? 6/7: What should Floyd do with the ladder? How does Floyd feel? 8/9: What will Floyd do now? If you were Floyd, what would you do next? How does Floyd feel right now? 10/11: Who did the ladder belong to? What color is the paint? Where did Floyd thow the paint? How does he feel now? 12/13: Why is he throwing all this stuff? Where is he throwing it? 14/15: Why is this person saying, "hello" with their head inside? How does she feel? Who got thrown in the tree? 16/17: If this was a real tree, what would happen? How is he going to get this stuff out of the tree? 18/19: Could Floyd really get all this in the tree? Why or why not? 20/21: How does Floyd feel? How does the milkman feel? 22/23: What should Floyd have done with the firemen? Where did he throw the firemen? 24/25: Who will be upset with Floyd? What should Floyd do with the saw? Why is there a lightbuld over Floyd's head? 26/27: Was that a good idea? What will happen next? When will Floyd stop throwing things in the tree? 28/29: What sis Floyd forget? what will happen next? Pragmatic: Add some thought bubble post-its to the characters and have the kids fill in what they could be thinking (both Floyd and those stuck in the tree/discorvering that he threw their things). Articulation: of course, any kiddos working on "st" are going to get lots of repetitions in! Have them write down any "st" words they hear during the story and share them at the end. Challenge them to add as many "st" words as they can to their list. "Stuck" is so beloved by kids that they I'm sure they would delight in writing their own tales with the same theme. If I had more time I would definietly extend the book in this way. It would be a good time to introduce some of the literary/sylistic concepts that come up in the book, e.g., hyperbole, cause and effect, problem and solution, ellipses, capitalization, etc. Hope you find these suggestions useful. 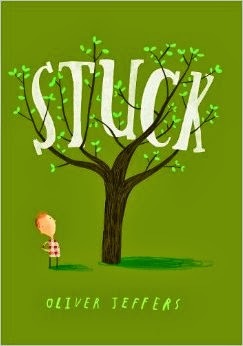 Let me know if you've read "Stuck" with your kiddos and how you apply it to therapy!